Pick a number between 1 and 500 ... closest (but not over) WINS 1 free pattern of your choice. Can you contact me and let me know what pattern you would like? I love the sandcastle halter! I pick number 349! I pick number 353. My favorite Jocole pattern is the Basic Knit Leggins. I have made them many times for my granddaughter, Abbi. I'd like to try the a-line shift dress with ruffle leggings! 221 Love those ruffled leggings! 333! Love the racerback / tee with the flounce! 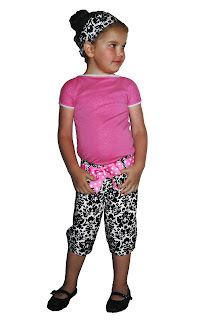 423 Mega Ruffle Pants - shorts, capris, and your pixie strip skirt! I love the Triple Ruffle T-shirt Dress! Too many great patterns to pick just one! 438 I love the vest!!! 452 - A line shift dress or ruffled leggings for me! #333 I love all the patterns, current favorite is the Mega Ruffle Pants/Shorts My dd loves the shorts! My favorite pattern that I own is the leggings pattern, but I would love to try the new mix and match patterns! 22. I love your racer back dress with the ruffles. Adorable! My Number is 236 and I love the Bouncing Bubble Skirt/Short. I love the everyday ruffle knit pants - my number is 311. Fun contest! I forgot to leave what my favorite pattern was. My favorite pattern is the basic knit leggings pattern. So easy too make. And my number is 15. Number 4 love the ruffle leggings! 137-I love the circle flounce dress! 282 I love the flounce ruffle pants! 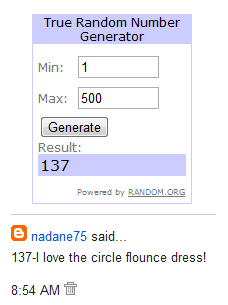 thanks for playing ladies ... i updated the post to announce the winner ... CONGRATULATIONS NADENE!! !